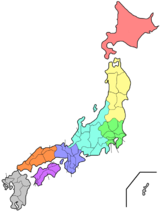 Toyama Prefectur (富山県, Toyama-ken) is a prefectur o Japan locatit in the Hokuriku region on Honshu island. The caipital is the ceety o Toyama. Toyama is the leadin industrial prefecture on the Japan Sea coast, an haes the industrial advantage o cheap electricity frae abundant hydroelectric resoorces. It an aa contains East Asie’s anly glaciers ootside Roushie, first recognized in 2012. ↑ 1.0 1.1 1.2 1.3 "富山県の魅力・観光>シンボル". Toyama Prefectural website (in Japanese). Toyama Prefecture. Retrieved 9 September 2011. ↑ Nussbaum, Louis-Frédéric. (2005). "Toyama prefecture" in Japan Encyclopedia, p. 991 at Google Books; "Hokuriku" at p. 344 at Google Books. ↑ Nussbaum, "Toyama" at p. 991 at Google Books.